Hayes junior Piper Adkins soars toward the hoop for a layup during a game last season. Adkins will run the point for the Pacers this winter. When Lou Tiberi and his Delaware Hayes girls basketball team take the floor for tonight’s season opener against host Patriot Prep, it’ll mark his first game as a head coach. That hardly means he’s inexperienced, though. Tiberi spent nearly three decades coaching boys basketball, primarily as an assistant at Upper Arlington and DeSales. The last seven seasons, meanwhile, he was the varsity assistant for the girls team at UA — a squad which won three OCC championships and two district titles during the span. That said, Tiberi plans to bring some of what made the Golden Bears successful to this year’s edition of the Pacers. “Our goal is to play an up-tempo game,” he said. “We would like to push the ball up the court and play more of a transition style of basketball … put pressure on the defense as opposed to going against a set defense. Hayes doesn’t return much experience, so the four players who are back from last year’s team — senior captains Rachael Bourget, Madison Eldridge and Jessica Walker and junior Piper Adkins — will be expected to shoulder quite a bit of the load. “All three seniors provide valuable leadership and experience on a team that will be made up of mostly sophomores and freshmen,” Tiberi said. Tiberi said look for sophomore Katie Smith and freshman Alexis Amabile to make some noise as perimeter threats while freshman Jordan Lantz will play in the post. Alyssa Griner and Karli Theis, both freshmen, will also see varsity action this season. 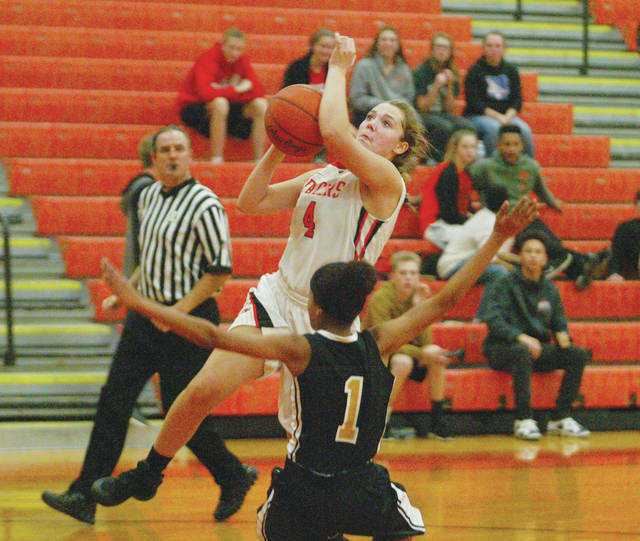 “Our strength will be our four returning varsity players … but we have a number of underclassmen that are gym rats and have put in a lot of work on their individual skills,” the coach said. “Now, they need experience and physical growth to realize their potential. The experience will come as the season progresses. As for the physical side of things, Tiberi said his team has been working on that for months. “We’ve spent three days a week in the weight room during the summer and fall, and will continue to lift during the season in hopes to be a physically stronger team than we have been in the past,” he said.